Right before school started, it was time for yet another Sunday Brunch! Everybody was back to Shanghai after the long summer break so it was time to catch up with everyone and also celebrate my birthday! 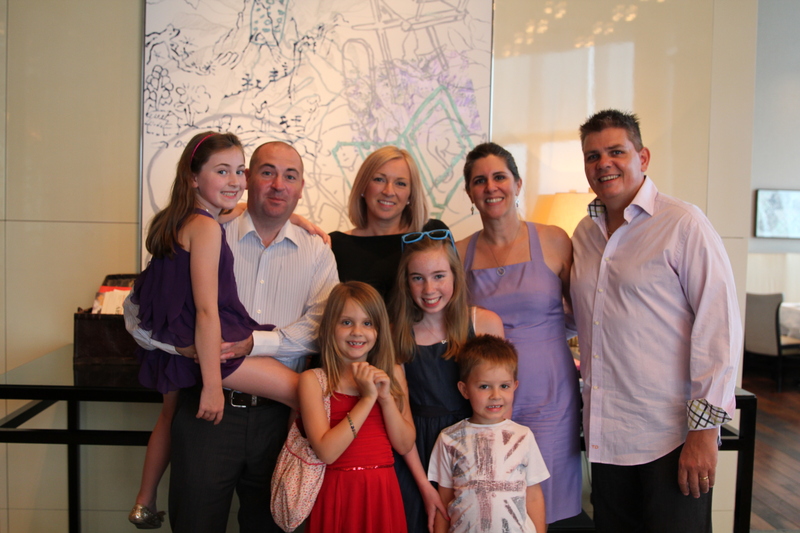 The Emerald gang headed off to an old favorite – The Intercontinental. I absolutely love their chocolate lollipops! I also love their free flow champagne! It was a leisurely 3-4 hours of eating, drinking, laughing, talking, and then eating some more and drinking some more. It was just a shame that there was not enough time to really get caught up with everyone’s busy summer. 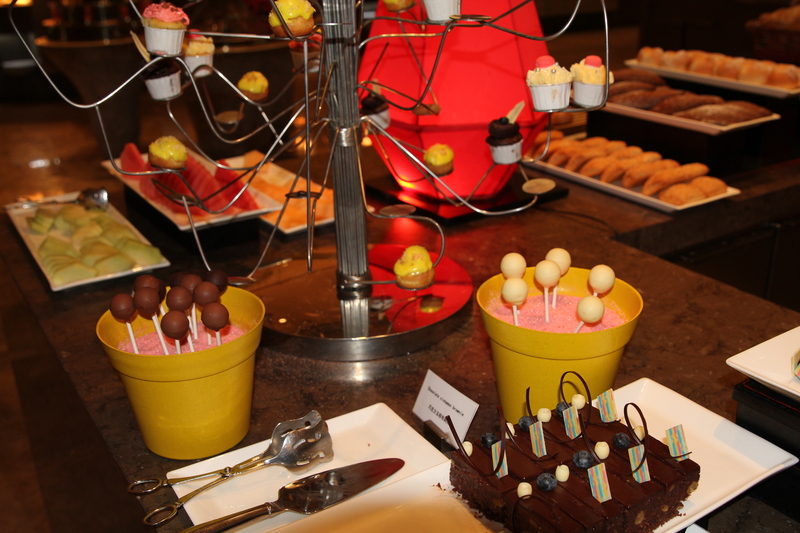 The food here is all good – cuisine from around the world so plenty of choice to suit every palate. 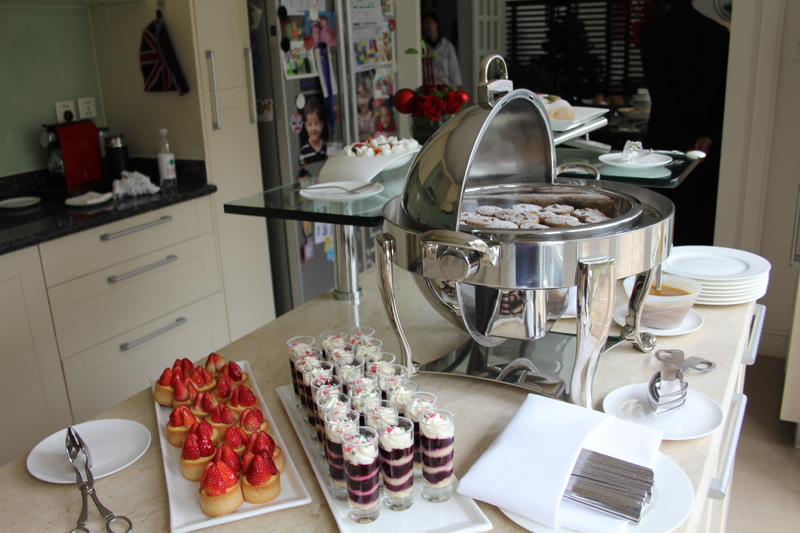 So many different buffet stations, you definitely need 3 hours to get around to each one! Owen, Sara & Earoel – in between Champagne courses! 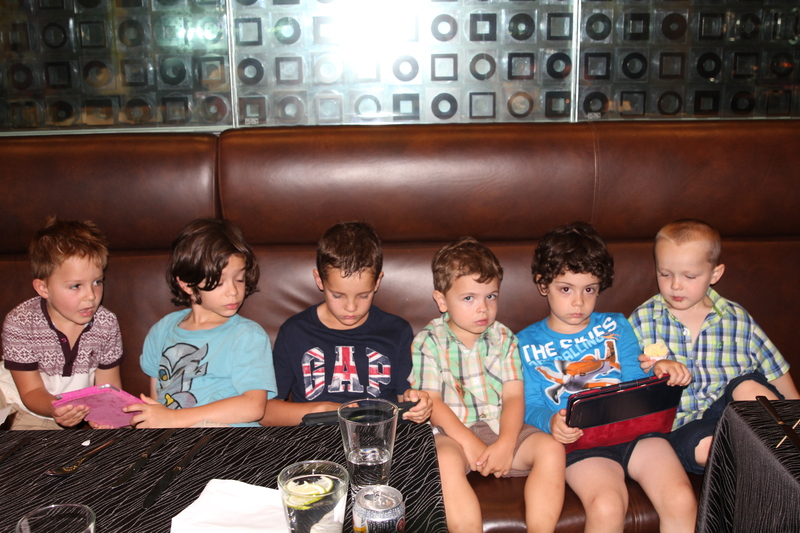 The boys were totally hooked on all their electronic devices! We rationed their time on these as there is an awesome kids club at the Intercontinental on Sunday. All the kids got to do loads of different activities, run around outside and get arty crafty. Great for the adults to extend their “adult time”. 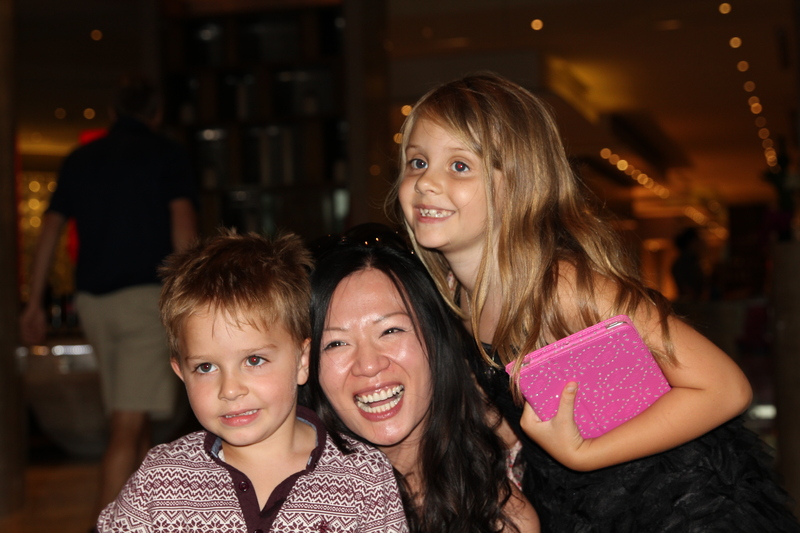 Oliver and Isabelle love Miss Earoel! 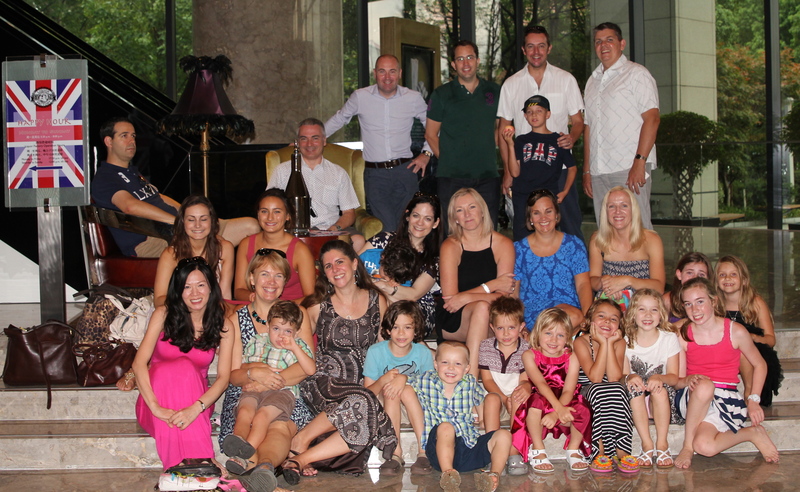 The Prestons, Steeles, Davis, Jones, Bartons, Rhinds and Kennedy! Plus Kids! 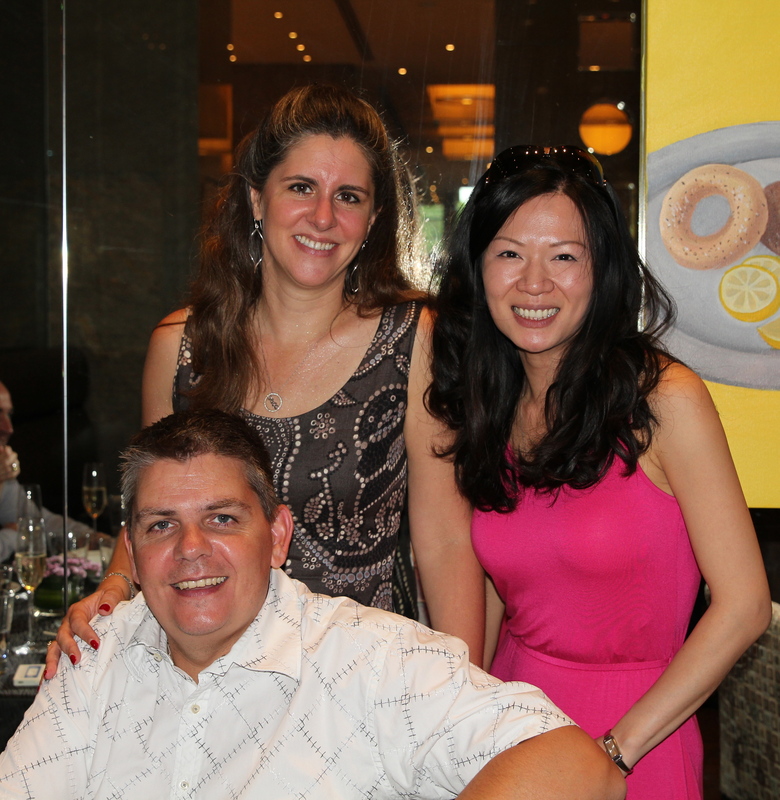 On May 20th last year, we enjoyed the Lobster Sunday Brunch in the tallest tower in Shanghai – the SWFC (Shanghai World Financial Center), AKA the Bottle Opener. When we asked Isabelle where she would like to go for her birthday lunch out, she said the Bottle Opener as she wanted Lobster, Crab, Shrimp and Prawn “on top of the world”. (I cannot think where she gets her expensive taste from!!!) Well, this year we had to make do with eating this in the 2nd tallest building in Shanghai as the “Shanghai Tower” is now officially taller! 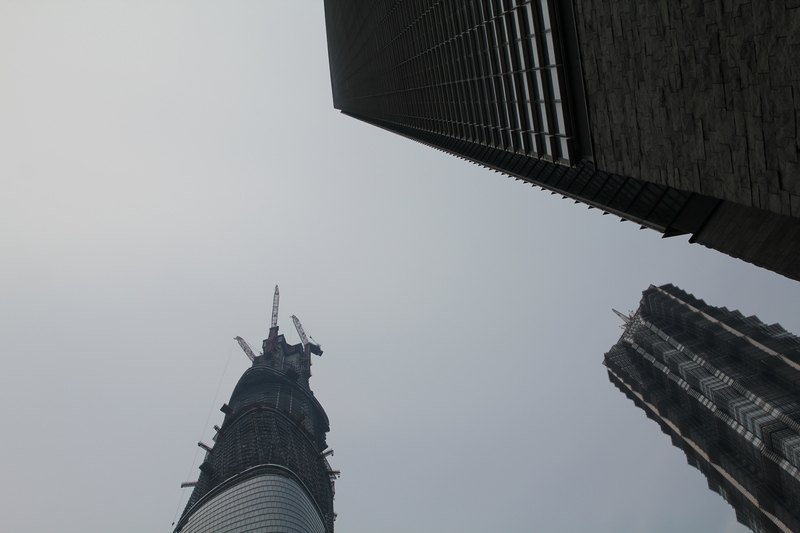 The Shanghai Tower, the SWFC (Bottle Opener) and Jin Mao Tower. Scott, Jo, Georgia and Saskia joined us and we had a lovely leisurely time. All the kids had fun too! Brunch is in the Park Hyatt hotel which occupy the 79th – 93rd floors of this tower. 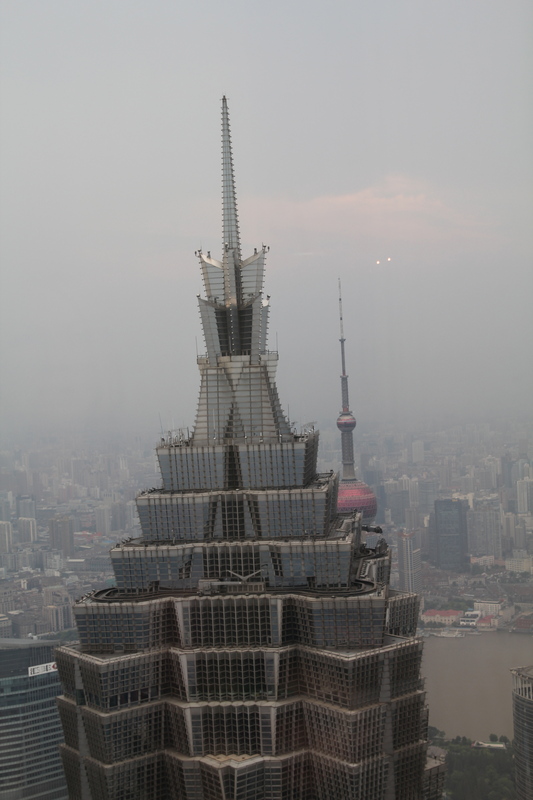 The view across the top of the Jin Mao Tower to the Oriental Pearl Tower. 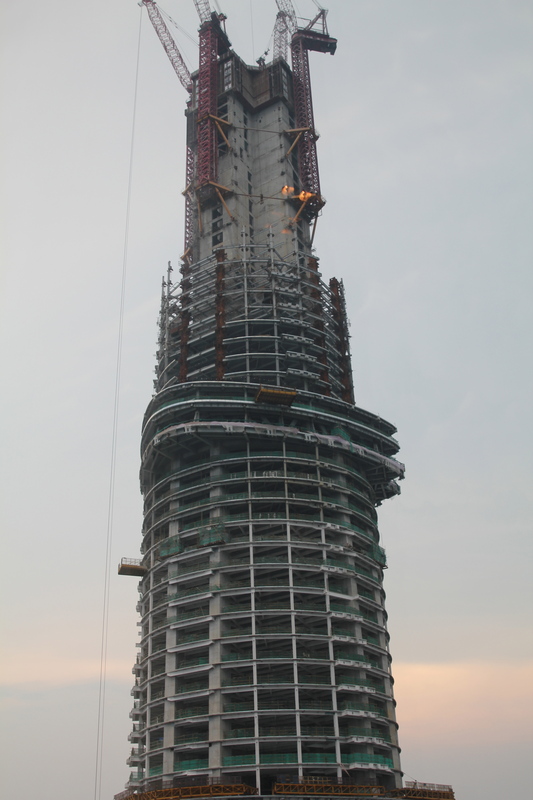 The view of the Shanghai Tower – construction is still going on the upper levels. 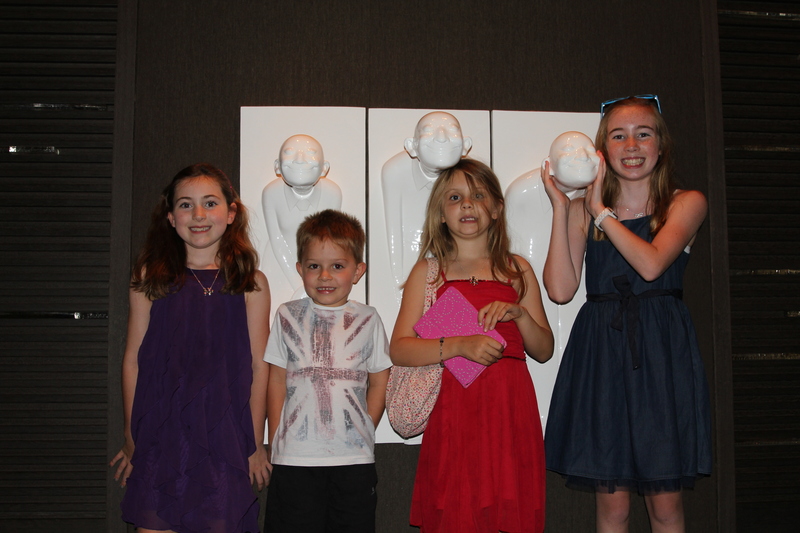 Saskia, Oliver, Isabelle and Georgia posing by the statues in the lobby. 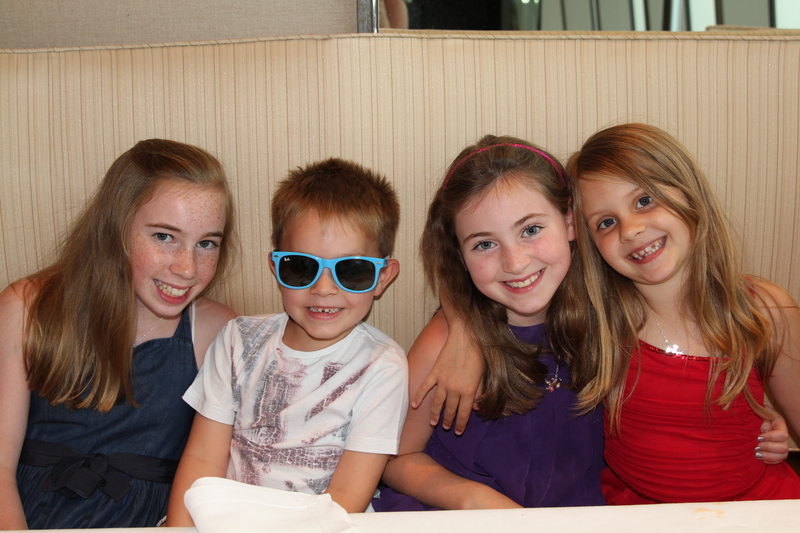 Saskia, Scott, Isabelle, Jo, Georgia, Oliver, Sara & Owen – a fab lunch out! 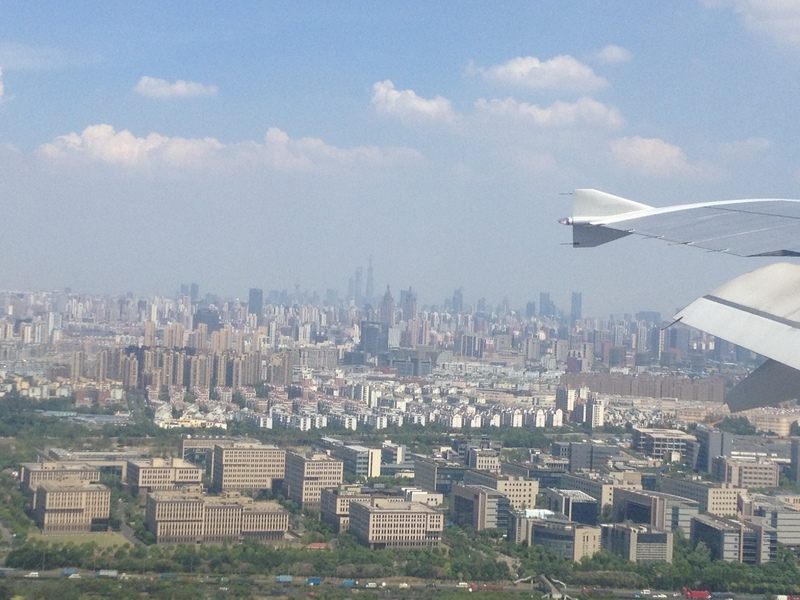 As I flew down to Shanghai (into the Hongqiao airport) from Beijing this week, I had an amazing view across the city. It is really quite the reminder of how many people live here because as far as my eye could see, the landscape is filled with apartment buildings and sky-scraper office blocks. Oh well, you have to put 24 million people somewhere! Apartment building after apartment building. Most of these are 15-25 floors high. As we got lower, I had a fantastic view (below). This is a low smog day, but you can still the haze across the city. It would be wonderful to take this picture on a completely clear day. The tallest building on the right of the photo (immediately below the wing tip) is the building that I work in – Wheelock Square. This building is 298 metres tall and has 61 floors – I work on the 47th floor and have a great view. 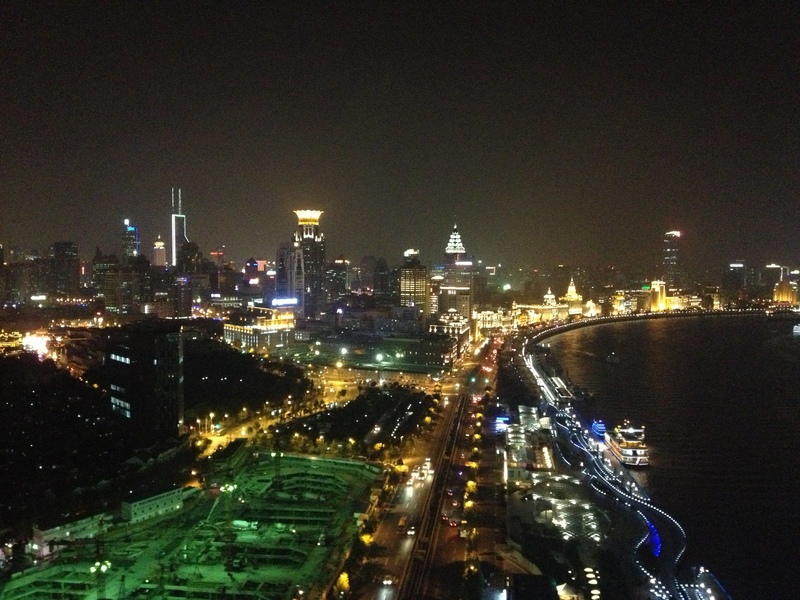 The view to Downtown Shanghai. 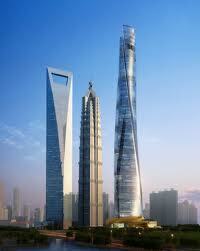 The Bottle Opener can clearly be seen along with the new tallest building in China – the Shanghai Tower. 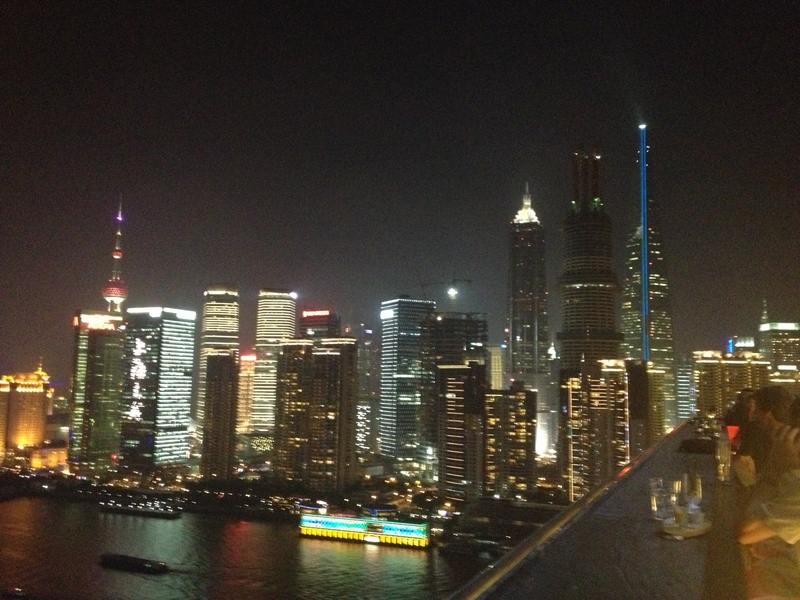 You can barely make out the Oriental Pearl Tower at the left of the 2 tall buildings. The Shanghai World Financial Center aka “The Bottle Opener”, the Jin Mao Tower and The Shanghai Tower – new skyline of downtown. 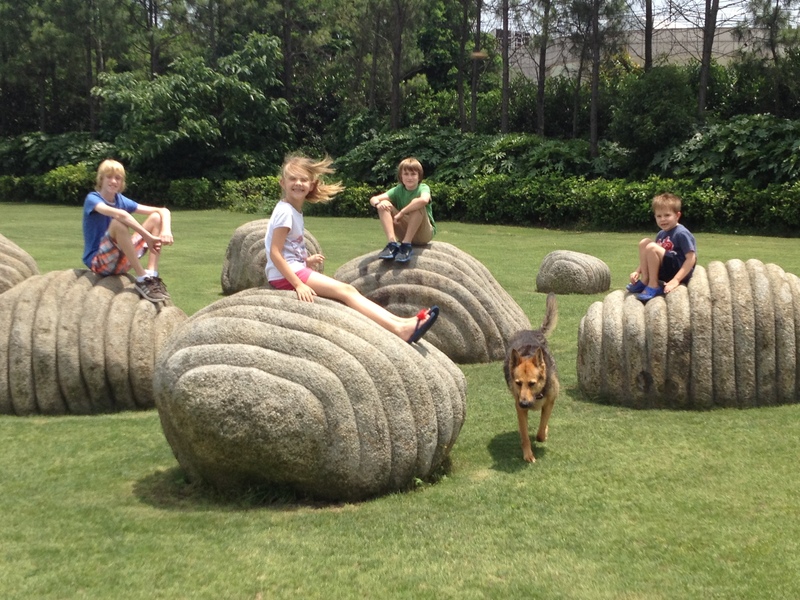 The Shanghai Sculpture Park is a wonderful day out, especially with a dog! 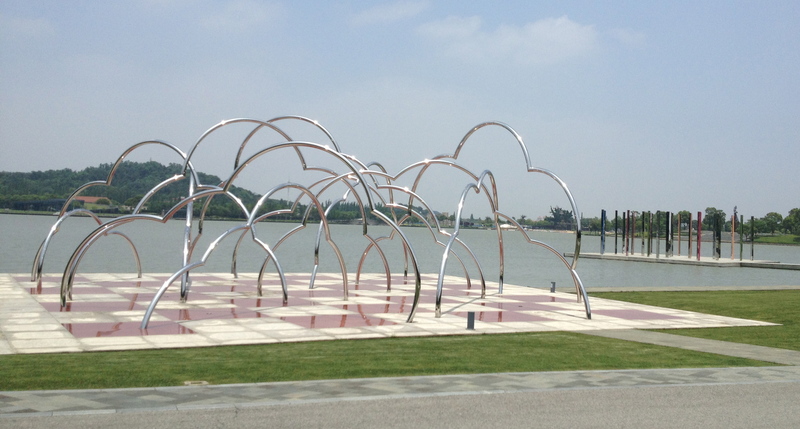 The Park opened in 2005 and is located in Sheshan area in West Shanghai. 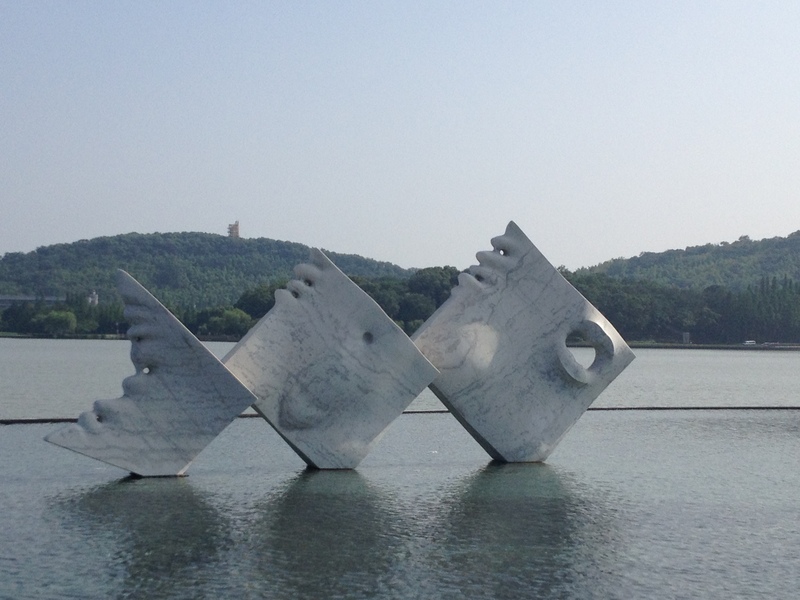 It covers an area of 85+ hectares, surrounded by the Sheshan mountains with Lake Yuehu (Moon Lake) at the center. 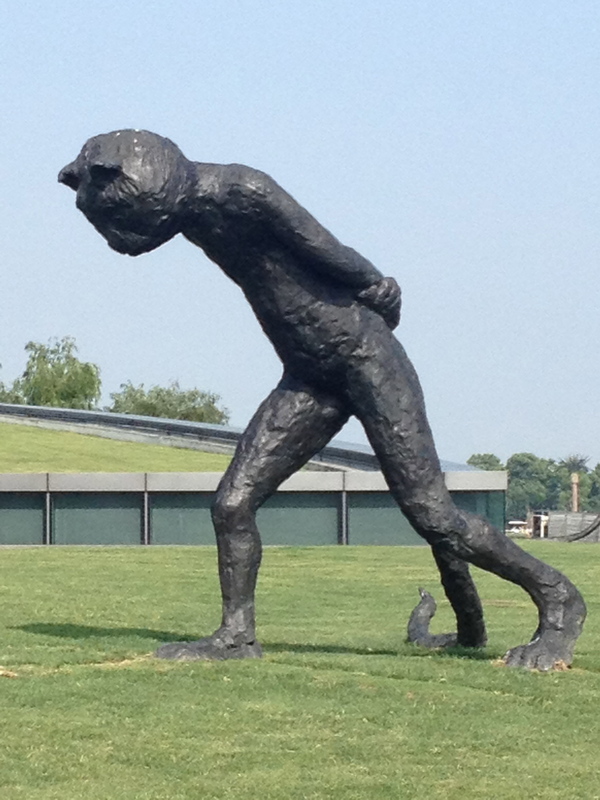 It is a beautiful location with more than 70 sculptures located around the park. 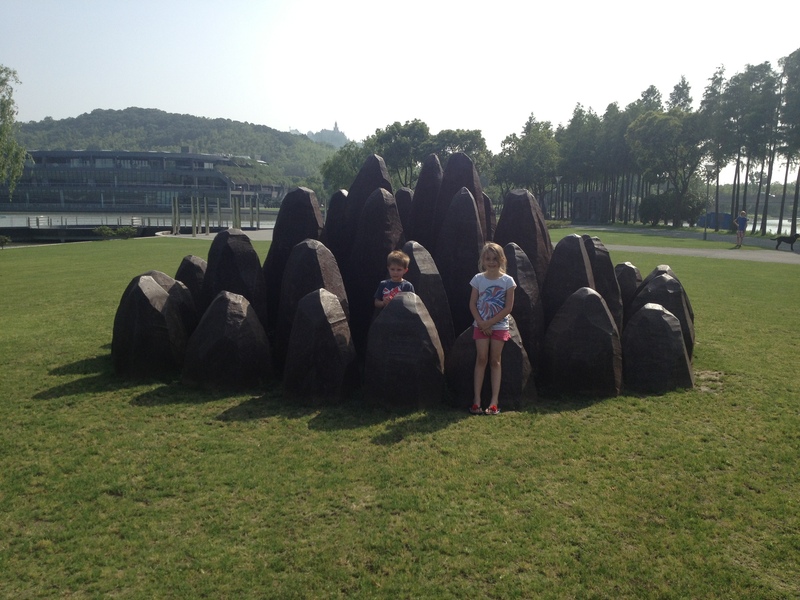 They were truly magnificent and the park encourage you to touch them, sit on them and experience them! On a lovely sunshine day, the whole family plus Tetley piled into the car for the 1 hour drive across to the other side of town. We had prepared a picnic so that we could spend the day enjoying the sunshine. John, Dan, Luke and their dog, Poppy, also joined us for the day. 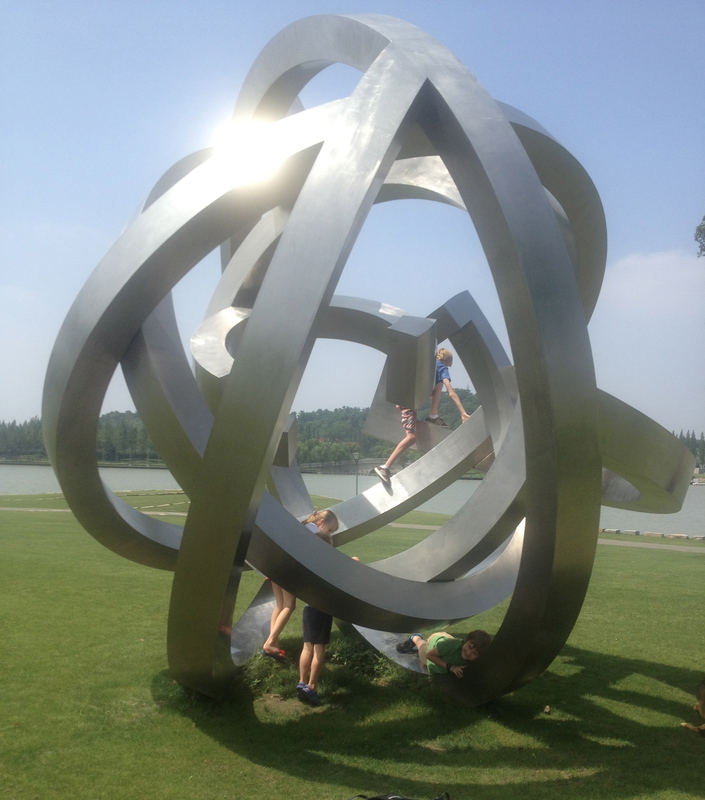 Dan, Isabelle, Luke, Tetley and Oliver – climbing all over 1 of the sculpture displays. These tall poles rotate around and catch the sunlight. 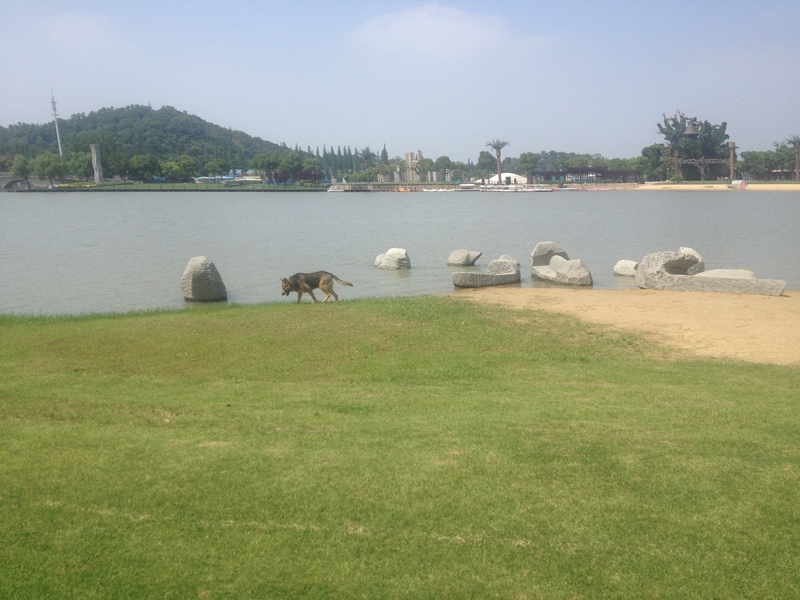 This park is quite unique in China as you are allowed to have your dog off leash. Tetley and Poppy both loved this and were racing around all day. Poppy (being a Labrador) was in the water as soon as she saw it! Tetley was so busy chasing her around that she was in soon after, much to her disgust!! 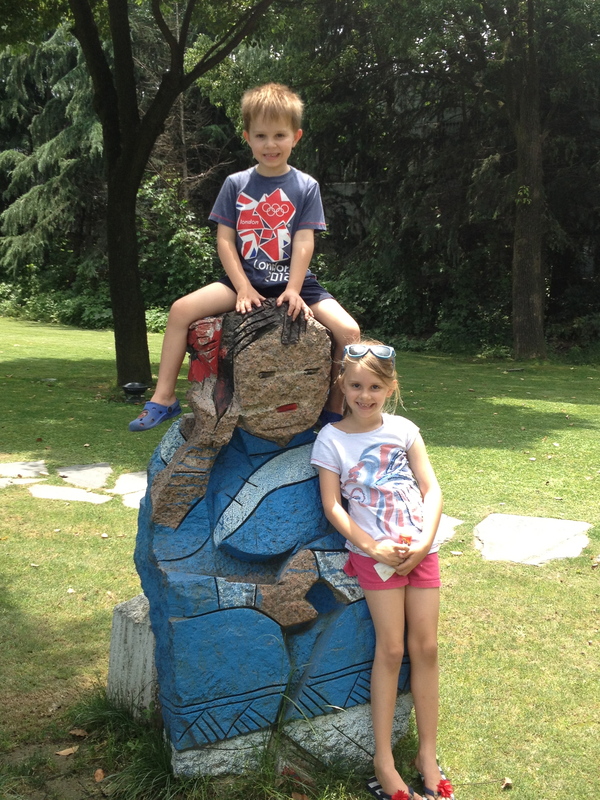 Clever rock formations – into a village of people. The 2 in front are real!! 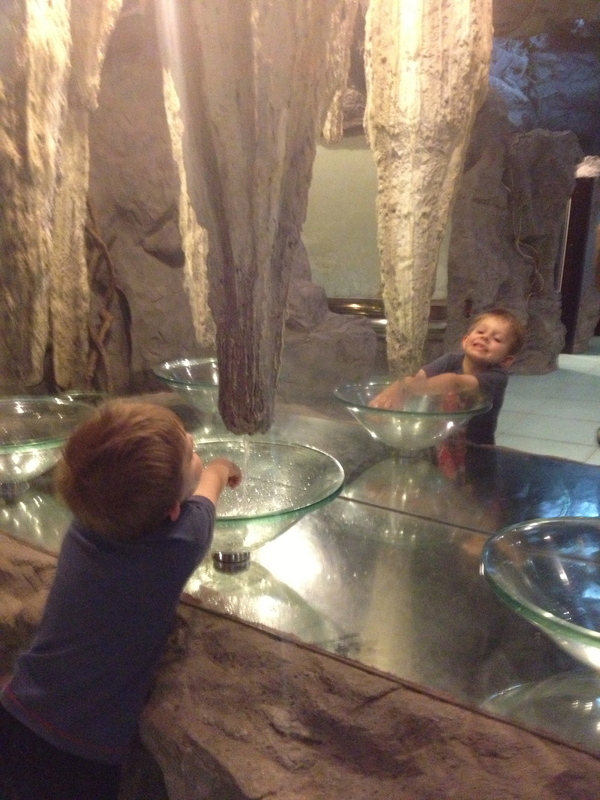 I was amazed that not only are you allowed to climb and touch the exhibits, but it is encouraged! 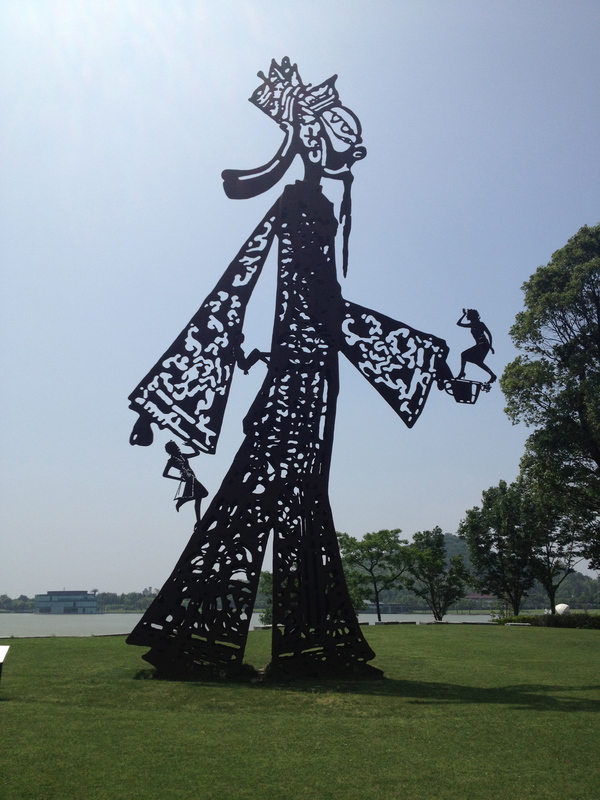 The sculptures are made of all sorts of different materials and are of varied style and design. Me and Isabelle trying to re-create the poses. 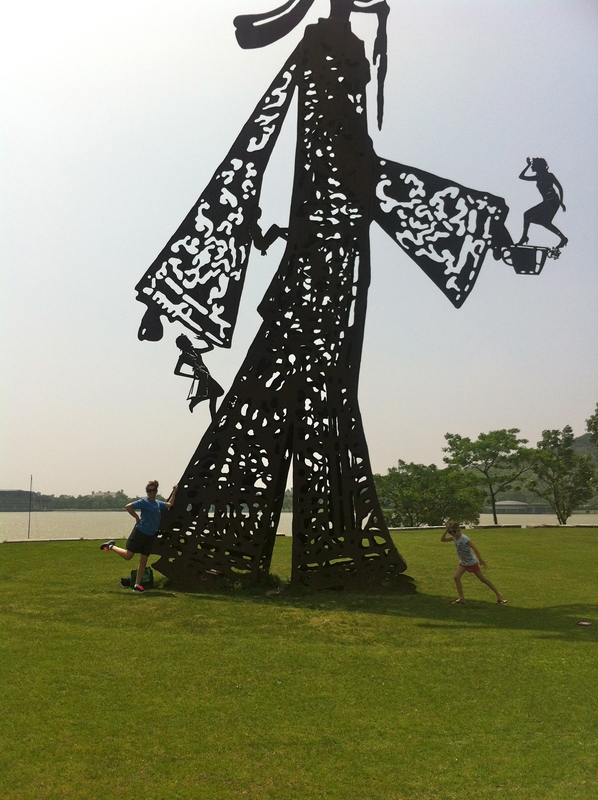 Everyone enjoyed climbing all over this one! 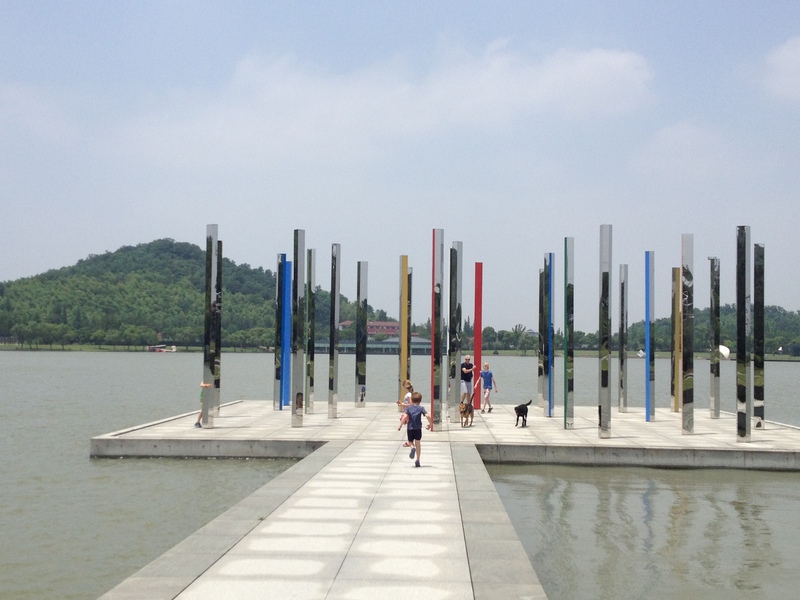 The walk around the lake takes some time if you are doing it at a leisurely pace. About half way around there is a man made beach (with people sculptures on the beach too!). 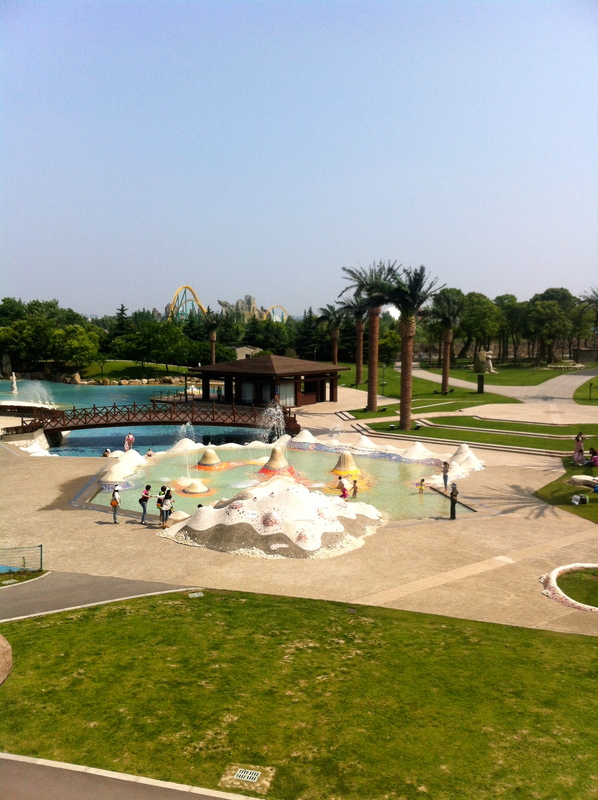 There is a small amusement park, several attractions for kids and places to eat and drink. Tetley paddling at the man made beach. 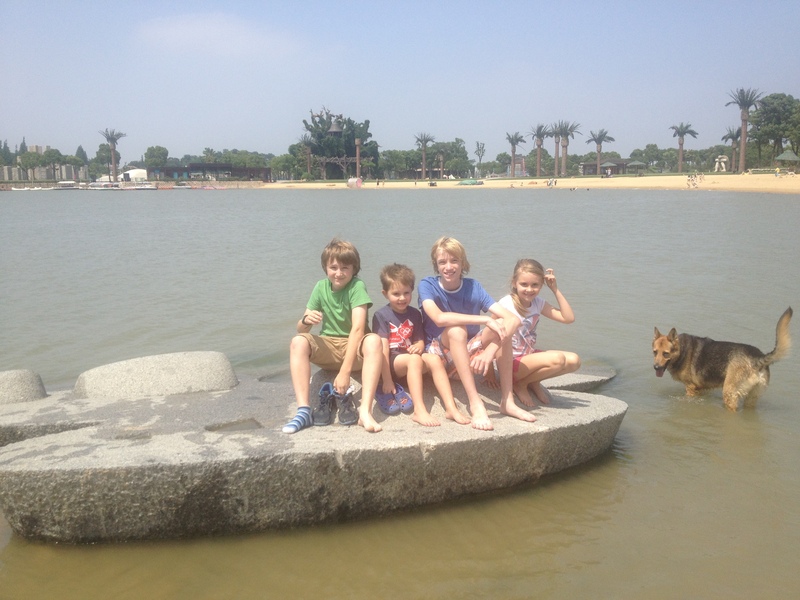 All of the kids – Luke, Oliver, Dan and Isabelle, sitting in a rock boat! Oliver got quite wet here – thank goodness it was a hot and sunny day! 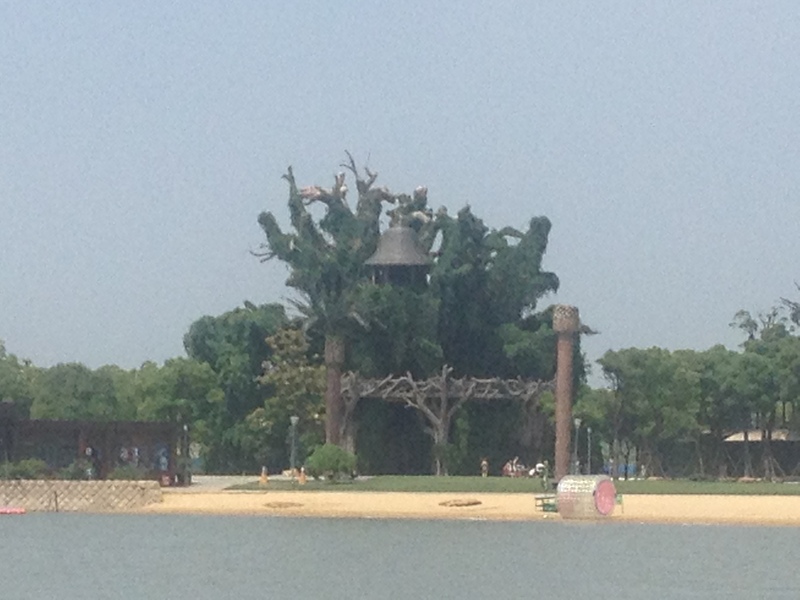 A tree house. 87 steps take you to the top where there are some gorgeous views. You can also see a water Zorb that is available to rent for fun on the lake. One of the views from the top of the tree house. Looking down into the water park from the top of the tree house. One of the activities in this area of the park is a giant bouncy sculpture. 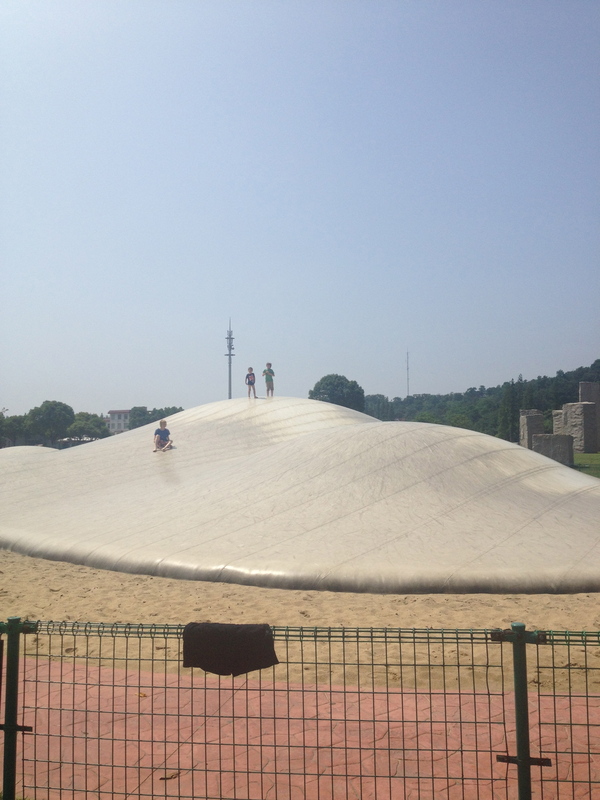 It is called the Fuma Fuma Dome and is a cross between an inflatable bouncy and a trampoline. I had a go with the kids. They loved it and spent considerable time running, bouncing and rolling around on this huge bouncy “thing”. As you can see from the photos, this park is not crowded. 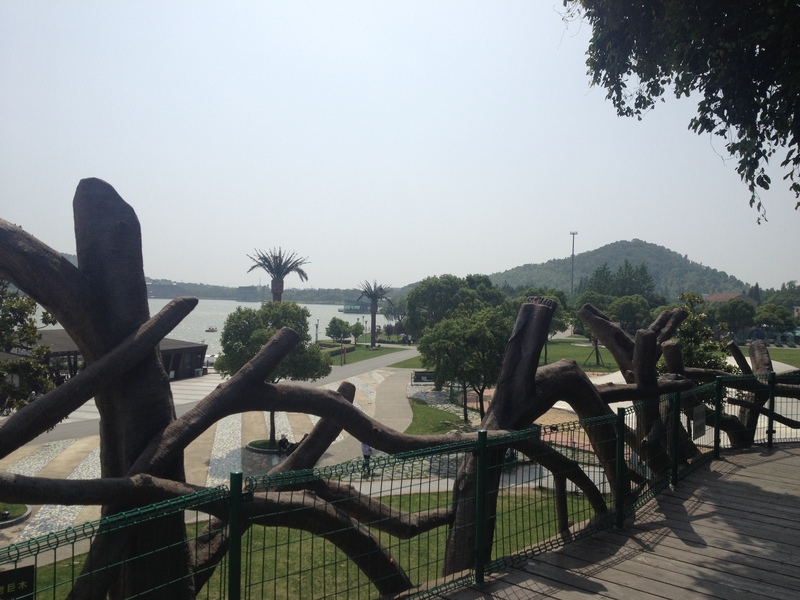 It was an absolute delight to discover this park that is well maintained, clean, quiet, fun and a great day out. 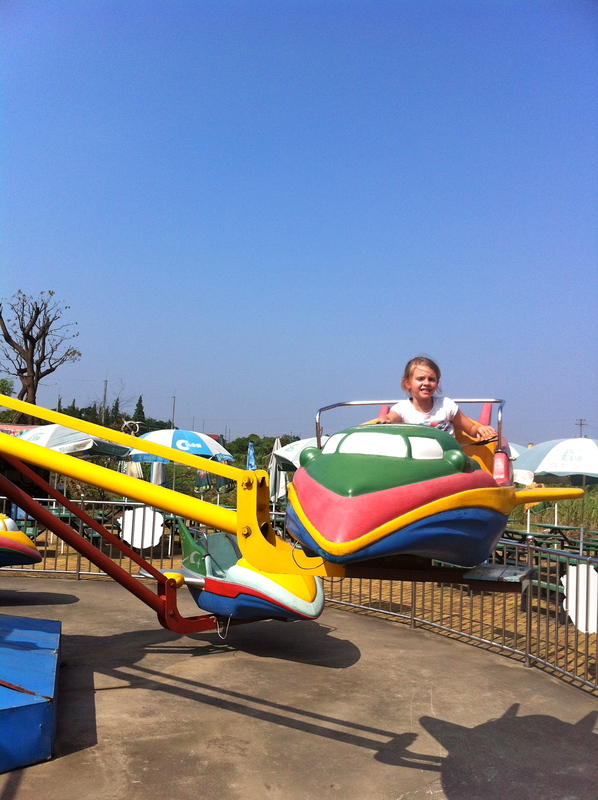 Isabelle riding on one of the attractions at the small fair at the back of the park. 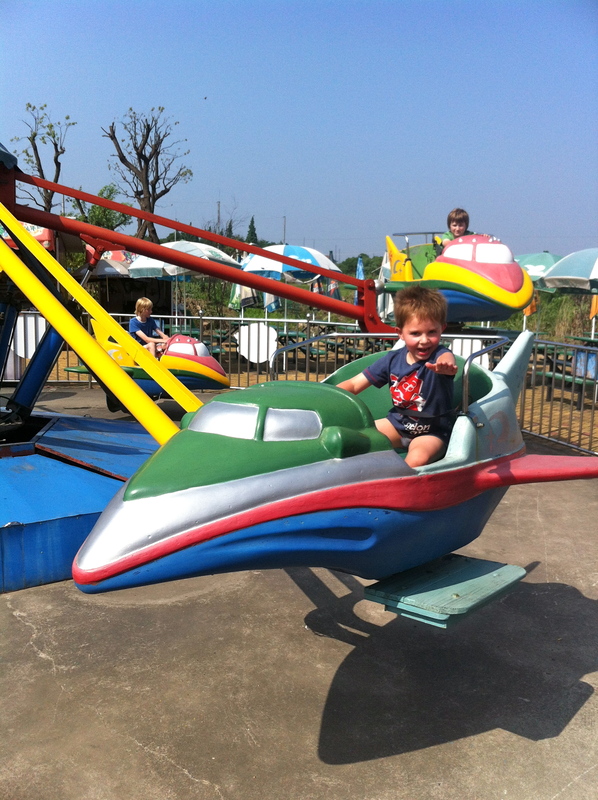 Here is Oliver – telling us all how he is controlling the plane going up and down! This reminded me of a Dr Suess character. I liked this stone fish on the top of the water. Almost all the way round the park at this point. We were all tired, sweaty and hot! I can highly recommend this day out. 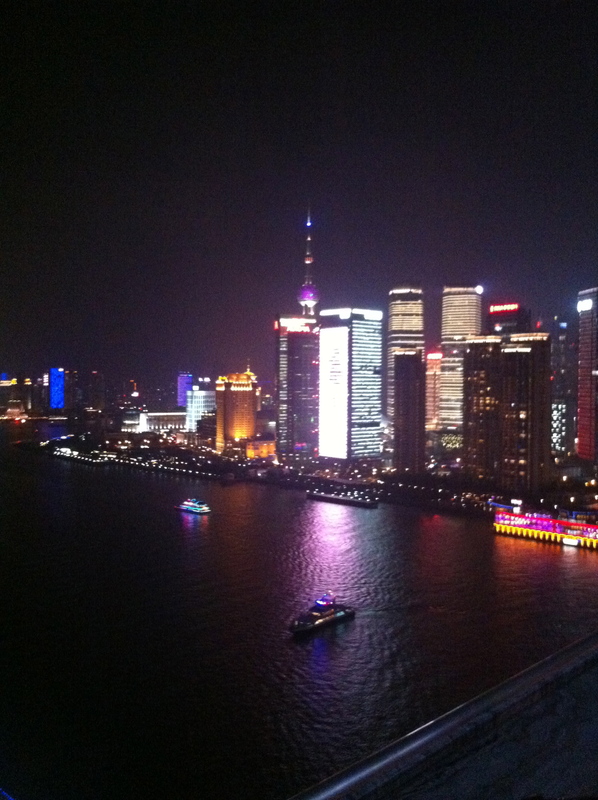 What a wonderful Christmas in Shanghai. We are so fortunate to have a large “family” of Ex-pats here who host so many wonderful events and look out for each other. 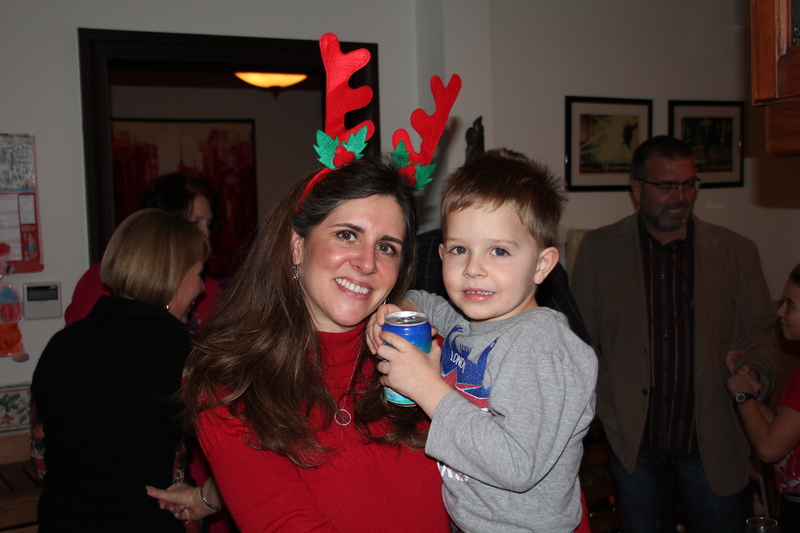 The season started with a “Stars and Stockings” party at Jane’s house. A fabulous night of laughter, 80’s dancing, great food and booze. 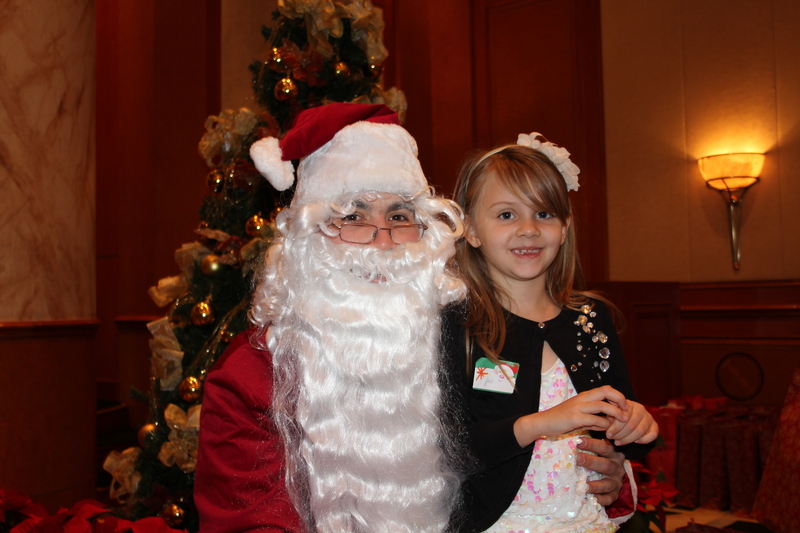 The next day, Isabelle and Oliver were at the Shanghai Expat Association’s Christmas Party at the 4 Seasons in Downtown Shanghai. 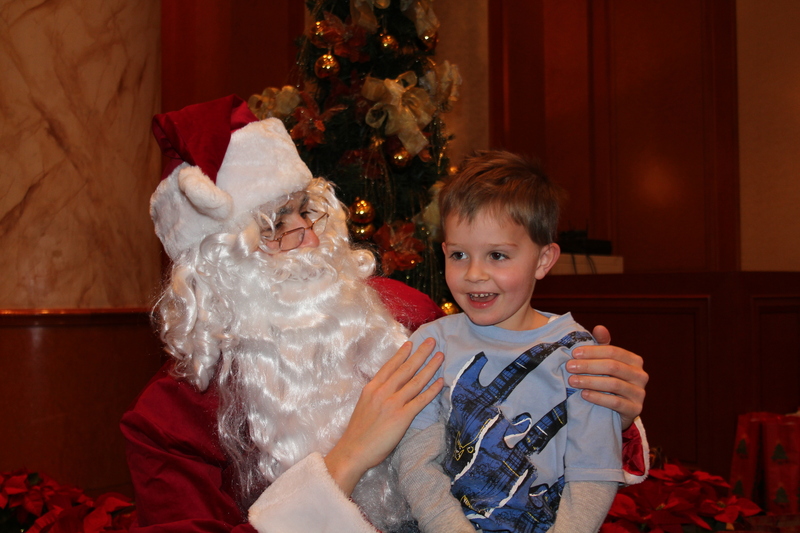 Even Santa came to visit them there! Kids from all nationalities from all over Shanghai were enjoying the festivities – so many crafts that the kids did not get through them all. They came home laden with home made Christmas tree ornaments, gingerbread houses and presents from Santa. On Christmas Eve, we were all at Marie and Tim’s house – with the same lovely group of people that we would be enjoying the rest of Christmas with. This was a lovely relaxed affair and we were home by 7:30 pm ready to continue exciting the kids about an imminent visit! 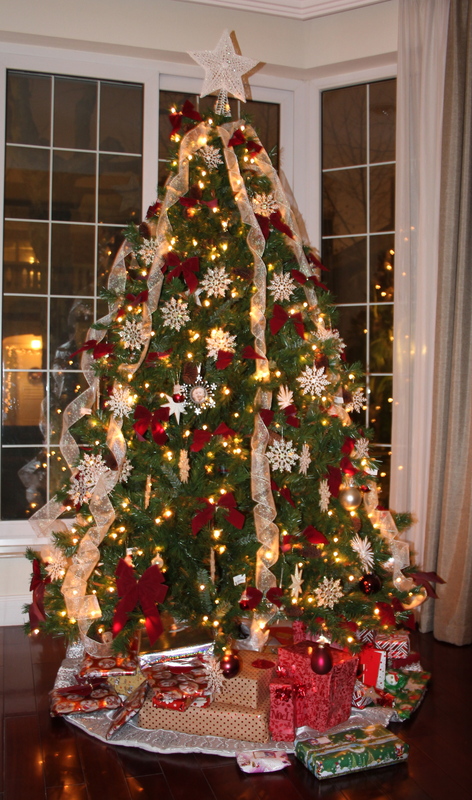 Our Christmas Tree – ready with presents. Christmas morning the children woke up at 6:30am. 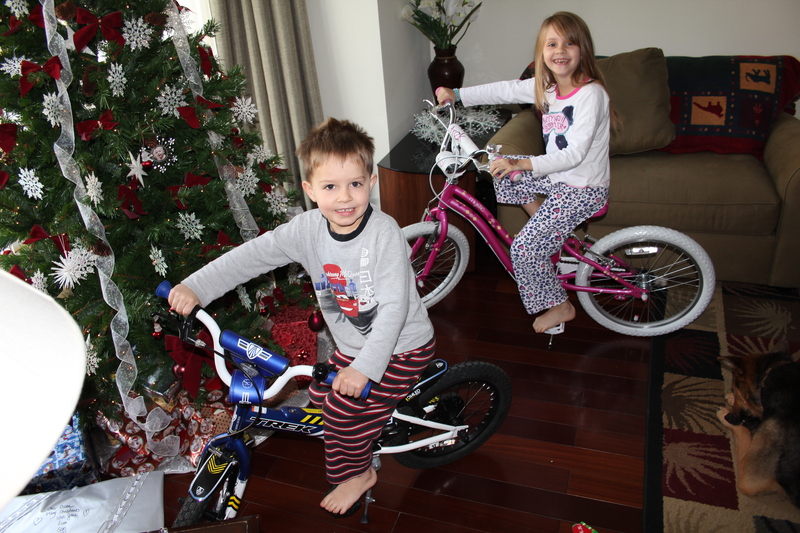 We could hear squeals of excitement and giggles as they opened their stockings together. They managed to contain themselves until 7:30 and then came in to “wake” us up. 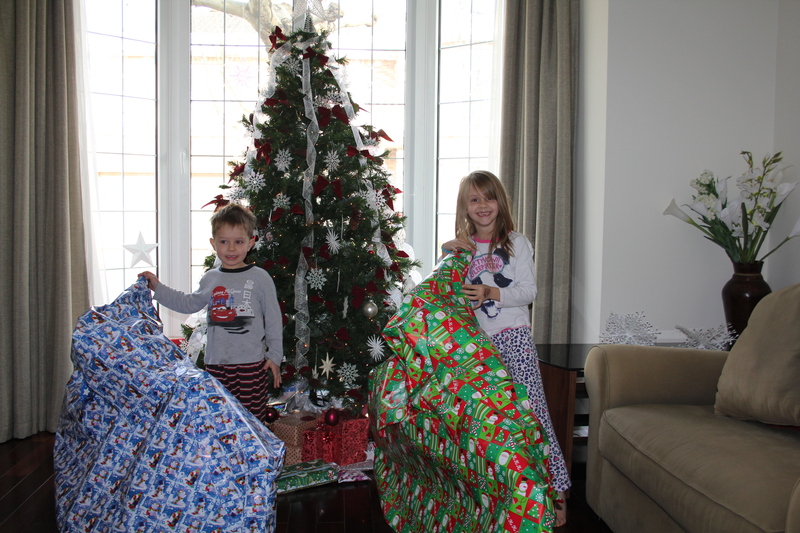 We had a wonderful relaxing morning opening presents, playing with toys and enjoying a leisurely breakfast. What could these possibly be?? 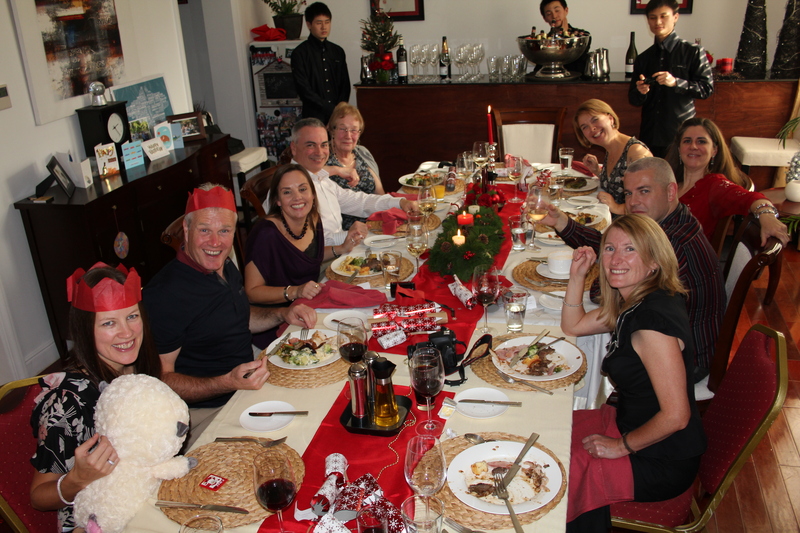 At 12.45 we walked around the corner to Lin and Nick’s house as they were hosting Christmas Dinner. Nick works for Intercontinental Hotel group and they were catering it, so no-one had the burden of preparing the meal. The staff had completely taken over the kitchen (using the garage as a staging area) and had even set up a bar! Half of us at the table (bar is in the background). We were 5 families in 1 house – 22 of us, including all the kids. We had a fabulous meal – 5 hours at the table, laughing all the time. 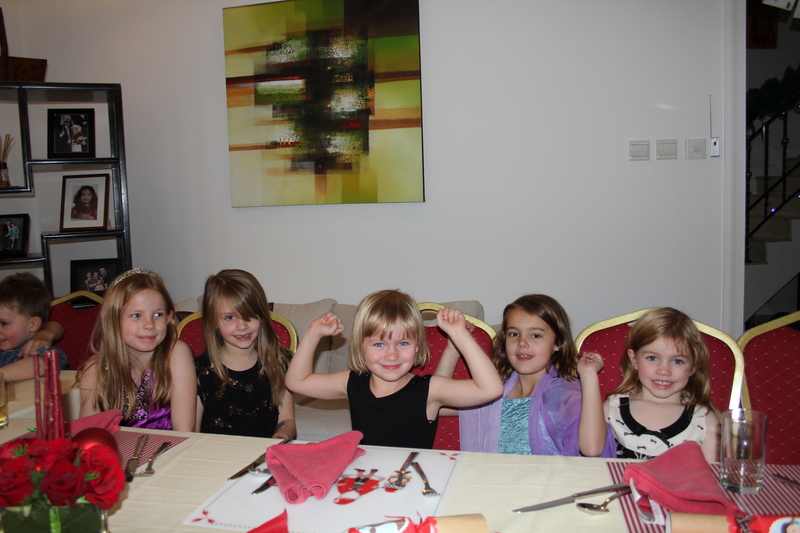 The kids managed about 45 minutes of eating before they were all off playing together. Again, it was so relaxing – no cooking or clearing up to worry about. When you are so far from home with no family around, this could not have been a better celebration. 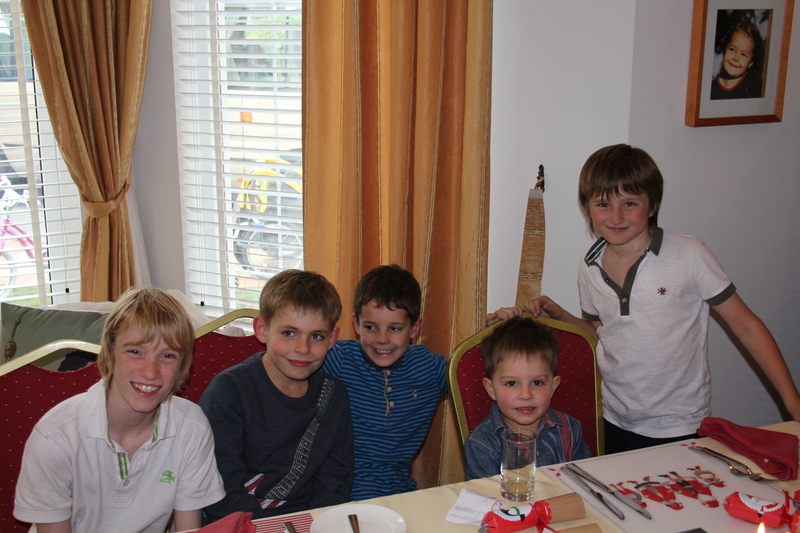 Daniel, Cai, Harry, Oliver and Luke. A choice of desserts. The mini Christmas puddings were delightful! 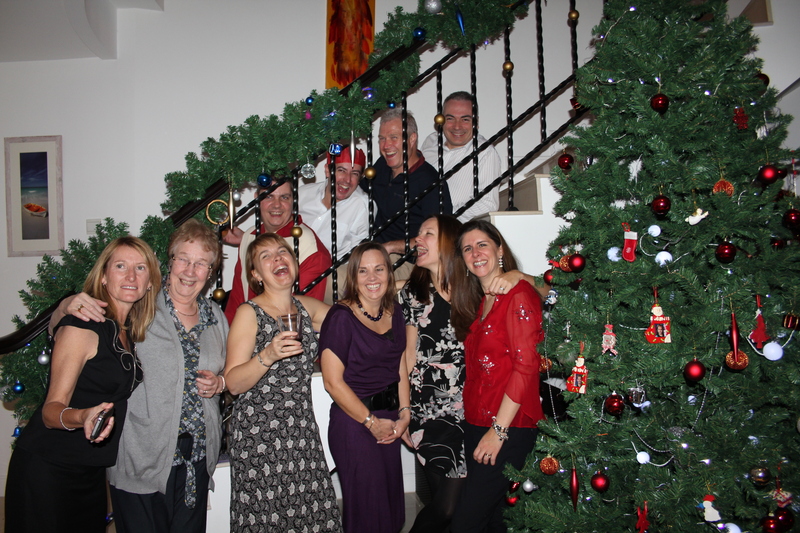 What a wonderful group of friends to celebrate Christmas Day with. 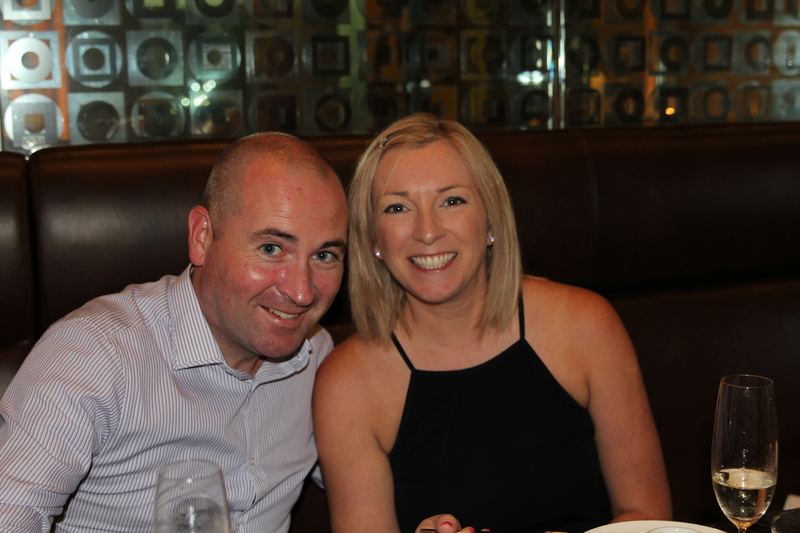 After a brief 90 minute re-charge back at home, we were off to more friends – Suzanne and Brian’s, for the evening. Another fantastic get together. Boxing Day, and it was our turn to host. The morning was a flurry of activity; cooking sausage rolls, legs of lamb and preparing for 30 people at our house at 3:00pm. Our wonderful Ayi, Angela, was a huge help and stayed through the afternoon to help with the kids. We had set up a craft activity area for them downstairs and some other friends had brought their Wii system for the older children to play upstairs. While they were occupied we played our traditional Boxing Day “Dirty Santa” game. Absolutely hilarious to see the tacky, gaudy gifts that people had found for less than 50RMB (£5/$7)!! It was the perfect wind-down from a very hectic Christmas and we were cleared up before 10:00pm. 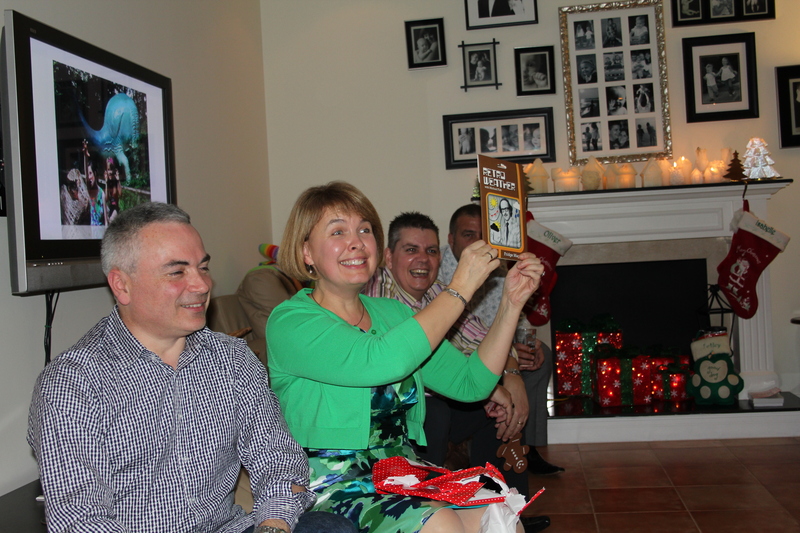 Jane opening Michael Fish fridge magnets in our annual “Dirty Santa” game! All in all, for a very different Christmas, it was perfect. 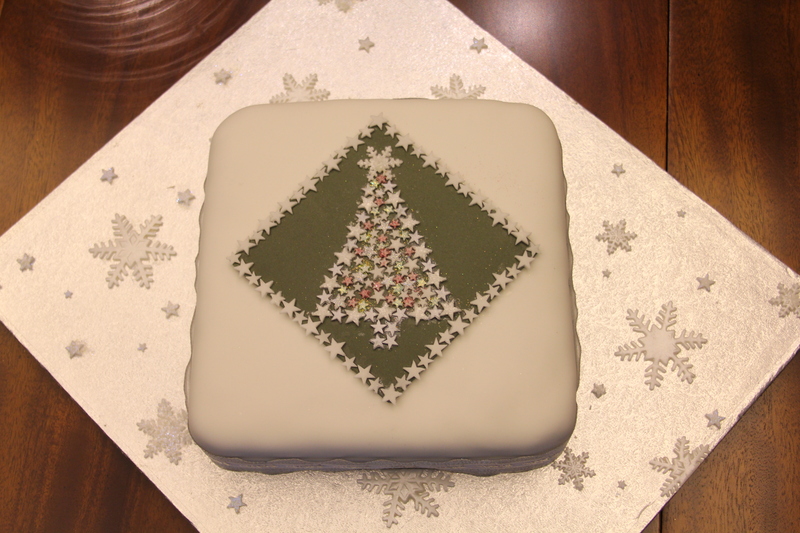 Owen’s fabulous Christmas Cake. Beautifully fed over the last 2 years and then beautifully decorated. Better than any “professional” cake!! It was YUMMY! 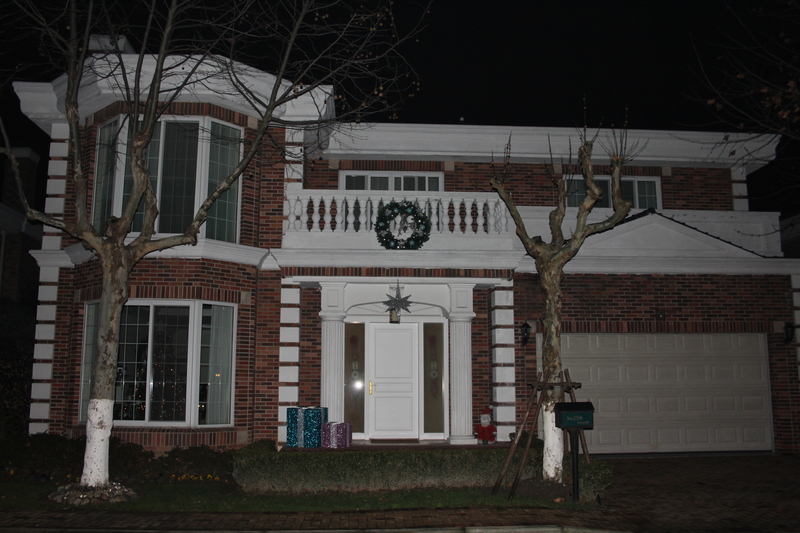 Our house all decorated for Christmas. This weekend we are going to Chengdu in Sichuan province in Southwest China. It is the capital City of Sichuan and is home to approximately 14 million people. It is designated as a Tier 2 City. This got me thinking….. what is a Tier 1 City, how many tiers are there and what does it mean. Surprisingly, I could not find an official definition anywhere. I did, however, find lots of websites that have opinions so I thought I would summarize my findings. In the past two decades, numerous cities in China have experienced unprecedented economic growth and this economic phenomenon triggered the rise of a classification system based on “tiers”. This aims to rank cities throughout China in terms of their population size, development of services, infrastructure and cosmopolitan nature. Although the tier system is often criticized for being inexact and lacking standardized criteria, it can serve as a useful reference for companies that are trying to structure their China strategy. Beginning in the 1980’s, the Chinese government began investing large amounts of capital in major Chinese cities in order to stimulate economic growth in different regions of the country. Because every city experienced growth at its own pace, it became relevant for the economic and business communities to become familiar with this tier- based classification method. Tier 1 cities were the first to be opened to competitive economic development by the Chinese government. These cities are recognized for being densely populated as well as culturally and economically influential. Tier 1 Cities attract the attention of foreign enterprises given their large middle class representation and income levels well above the national average. Cities that fall within this category represent China’s most developed markets in terms of consumer behavior. First tier cities register total retail sales of around 30 billion RMB ($4.75 billion USD), and an annual per capita income of around 11,000 RMB (1,774 USD). Tier 1 Cities are: Shanghai, Beijing, Shenzhen, and Guangzhou. These cities are known for being important political, cultural, industrial and financial centers in China as well as key hubs for the greater East-Asia region. The rapid economic growth and rising incomes in 2nd tier cities has caught the attention of foreign investors over the past several years. The markets in Tier 2 cities are a lot less competitive and the labor costs are substantially cheaper compared to Tier 1 cities. A rapid increase in consumer spending in second tier cities is creating more demand for foreign brands. However, the income of consumers in second, third, and fourth tier cities has been reported to be less than half compared to those in first tier cities. At the end of 2011 around 60 cities in China qualified as second tier cities (China Sourcing). Some sources point to a more complex method of classification within second and third tier cities (rightsite.asia). This method of classification divides cities into three subcategories within their tier: high, medium, and low. 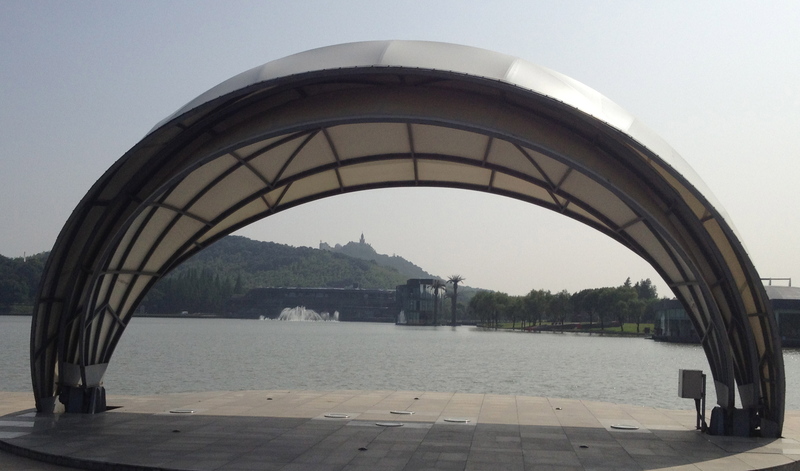 Tianjin and Chengdu are examples of cities that fall within the second tier high category. These two cities are considered rapidly developing economic centers. Within the second tier medium subcategory we see places like Nanjing and Xi’an where economic development shows relatively stable progress. Second tier lower cities are generally characterized for being the capitals of some provinces as well as cities that show increasing economic development. Second tier lower cities include Wuhan and Hefei. There are approximately 200 county-level cities in China that fall within the category of a 3rd tier city (China Sourcing). Within third tier cities there is also a categorical subdivision like I mentioned above. Third tier high cities include Zhongshan and Shantou. 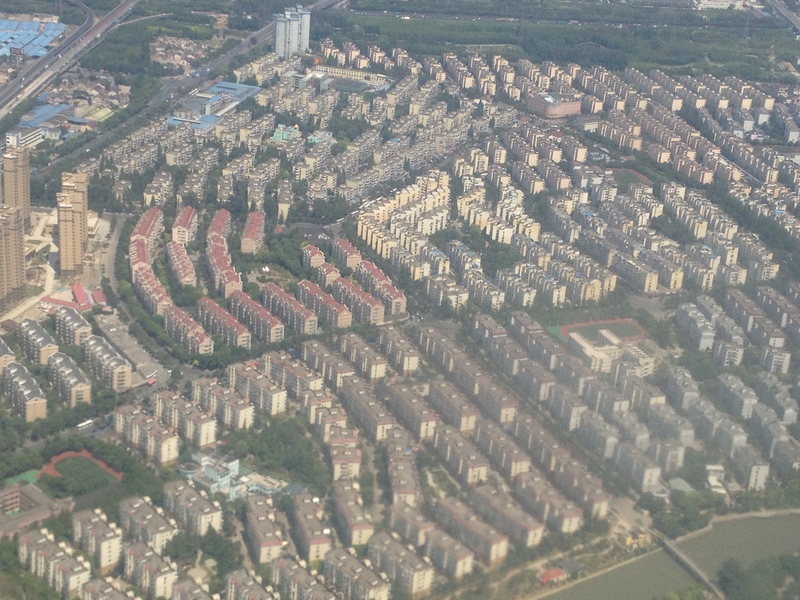 Third tier medium cities include cities like Xining and Baoding. I also wondered why the Chinese government created a system like this. Again, I could not find any direction or explanation. It seems that it is a useful reference for foreign investors who wish to establish a presence in China. 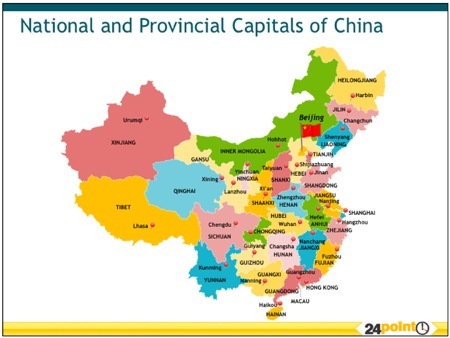 China has more than 120 cities that have a population of 1 million people or more. In fact, it is mind boggling to imagine 1.4 BILLION people in this Country. And, that 800 million of them live in remote, rural areas in relative poverty – that is more than double the population of USA to put it in context. Many of these people have never seen a 100RMB note (approx £10/$15). NOTE: This is not an official list!! I could not find a single listing for Tier 3 cities so by process of elimination, if you are in a Chinese city that is not listed as Tier 1 or 2, then you must be in a third tier city! End of a long week! 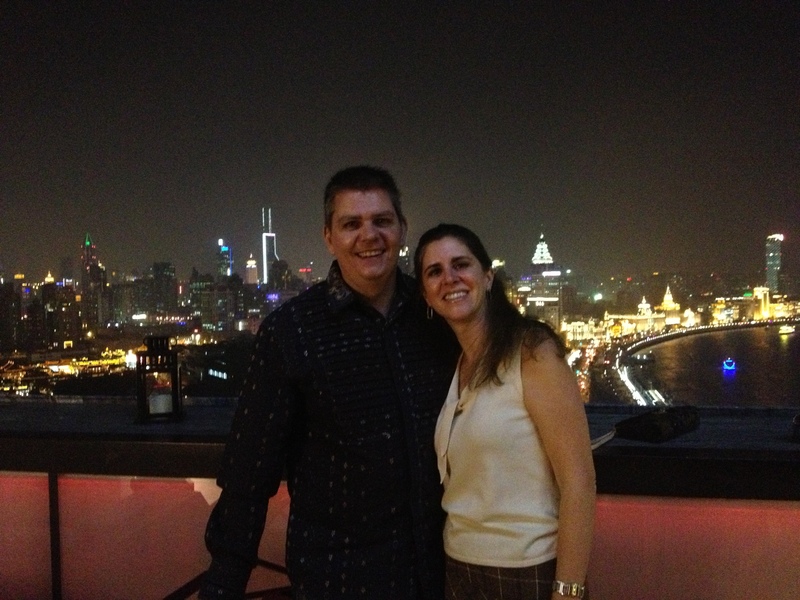 Friday night started with us heading to the Char Bar, which is a bar on top of Hotel Indigo on the Bund. 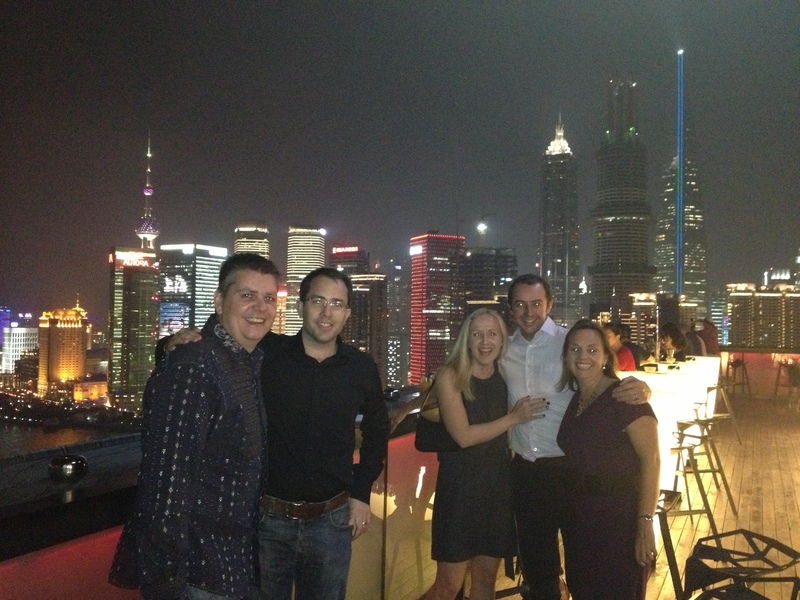 We were meeting friends from Emerald on the roof top for drinks before going to dinner in the French Concession. It was a fantastic evening. The ladies all wearing sleeveless dresses/tops and no need for a jacket! The weather is absolutely gorgeous this time of year. Loads of blue skies, sunshine, good air quality and warm! We arrived on the rooftop at 7.30pm and had a couple of cocktails there before leaving for dinner at Mr Willis. Owen, Matt, Emma, Nick and Lin at Char Bar, Hotel Indigo. Great view of the Pearl Tower, Bottle Opener and other downtown buildings from here. This is a fabulous location! It was a lovely relaxing start to the weekend – chilled glass of wine, with friends, admiring the view and unwinding from the week. All of the boats around the Bund were lit up! 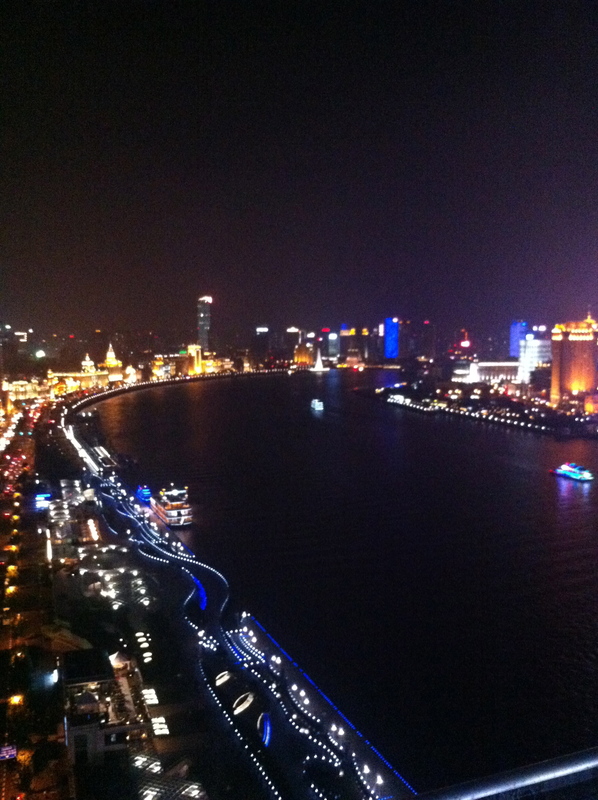 The Huangpu River at night. 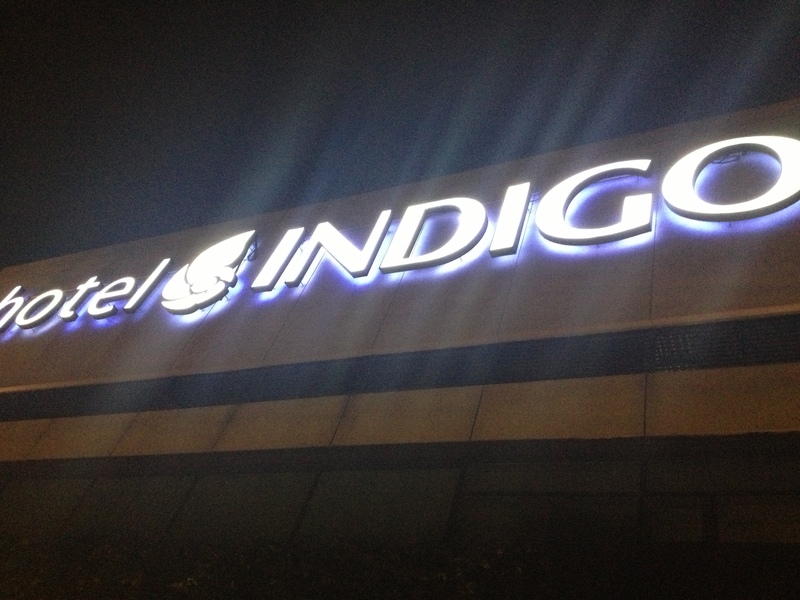 We can highly recommend Hotel Indigo! After such a good start to our evening, expectations were high for dinner! 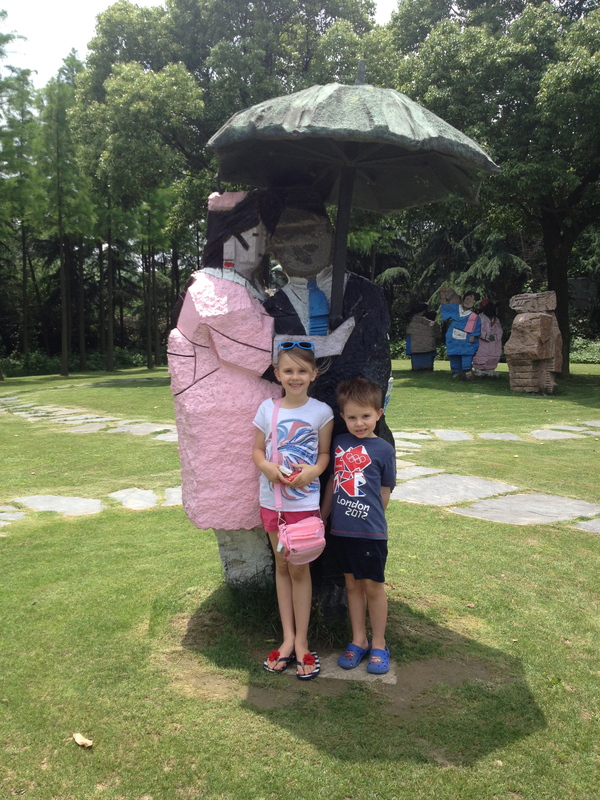 A short drive across town and we arrived at Mr Willis in the French Concession area. This area is very distinctive as there are lots of trees down all the avenues and there are many “boutique” type shops, cafes and restaurants. This area is probably the most western within Shanghai. Mr Willis restaurant is on the top level of a building with a couple of other restaurants in it. The menu is all western and top quality. I shared the Goats Cheese Souffle with Emma (Owen ate a whole portion) to start with and then had Lamb Shank for my main. Owen had ordered the Roast Beef which was actually the biggest steak I have ever seen, but so delicious (over 50% came home in a doggy bag with us!) My lamb shank was fall-off-the-bone tender, and perfectly accompanied with couscous and a tomato based sauce. Owen had lemon sablee for dessert and I had pavlova – both melt-in-the-mouth yummy! It was a fantastic meal for both of us. 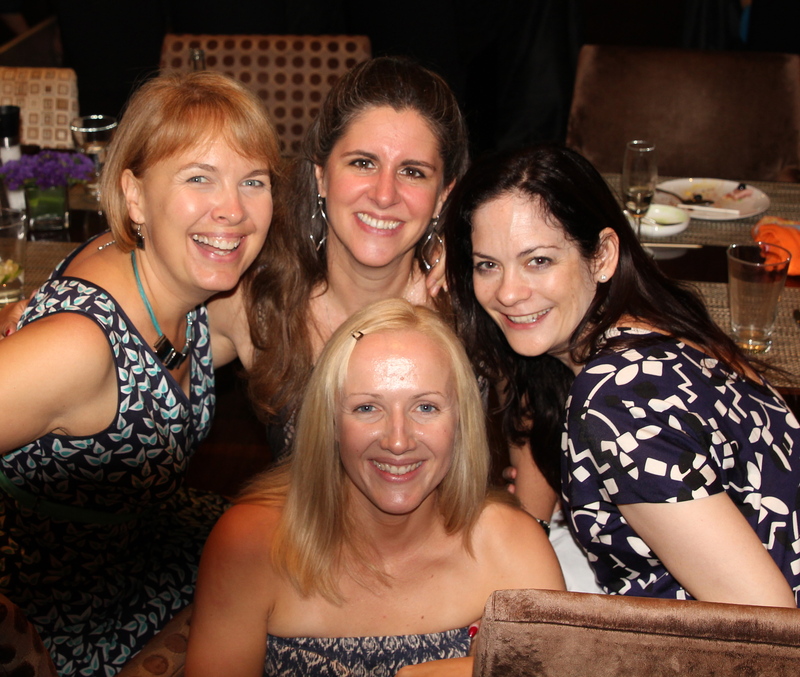 A lovely evening, with lots of laughs, good food, fine wine and friends. The perfect start to the weekend!